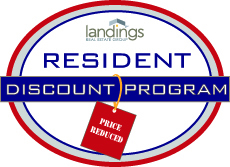 Welcome to the Long Meadow Landings Resident Discount Program! Residents can click on the "Find A Discount" link below to search special offers from local merchants. Business owners & representatives can use the "Offer A Discount" link to post special offers for our residents. We hope you enjoy this wonderful amenity offered by Long Meadow Landings!